I love tofu. They are just so good for you. They are, what we call, vegetable beef! Coming from soy beans, full of protein and calcium, sometimes I can understand why God created soy beans. Before the time when the East met West, far eastern Asians like Koreans hardly had dairy as a part of their diet. Tofu and the soy milk were the major source of calcium until the western dairy, the cow’s milk, cheese, etc were introduced much later time. Eating tofu is better than eating soy beans though. The nutrition in soy beans can be absorbed into our body only 65% where tofu (the processed form of soy beans) delivers 95%. 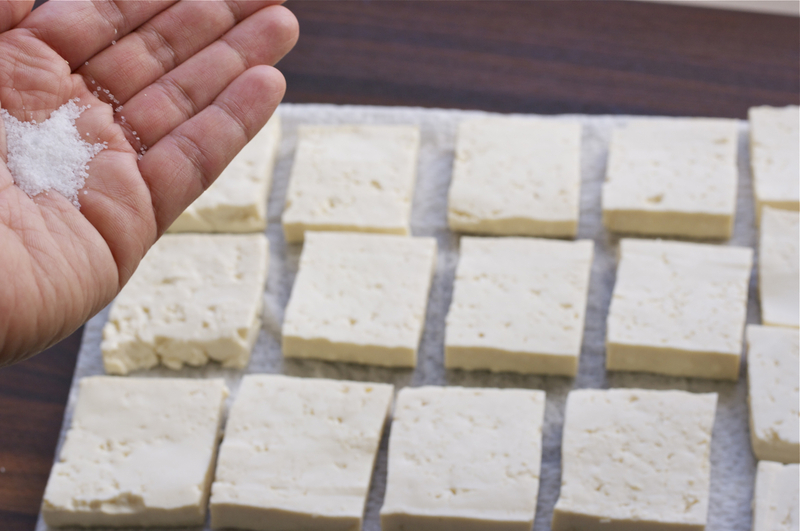 During the curdling process tofu keeps all the nutrition of soy beans except some vitamins. 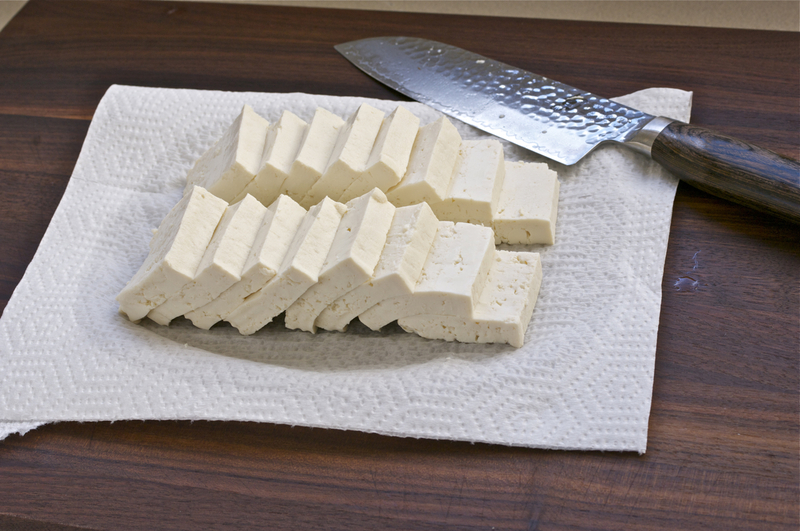 Tofu was originated from China, about 2200 years ago in Han dynasty and was introduced in Korea around 700AD. We call them “Dubu (두부)”. Koreans enjoy tofu in many different ways, in soups and stews, braise with other ingredients, mashed into make savory cakes, or simply pan fry them. I know there are some people who are afraid of tofu due to its non-flavored mushy texture. I don’t blame them because I wouldn’t want to eat raw tofu either. So I would like to introduce a simple way of cooking this mushy-non flavored soy bean creature into more chewy-flavorful delicacy. 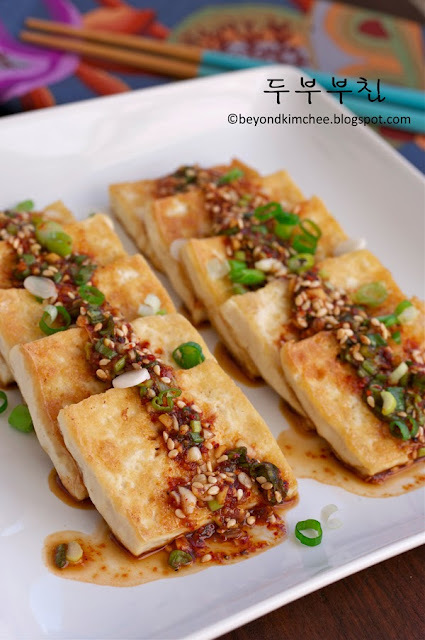 Perhaps this is, by far, the simplest Korean tofu dish you will make, level 101! But you gotta learn the technical side of it. As always I am here for you, so let the class begin! You must use FIRM tofu, preferably Korean. soy sauce, Korean chili flakes, sesame seeds, sesame oil, garlic, green onion, and shrimp powder. Shrimp powder is optional but will add very nice flavor to the sauce.I use quite often to my recipes. If you don’t want you can omit it. But my sauce will taste better than yours, ha ha! Click here to learn how to make shrimp powder. Rinse tofu first right out of package. Place on top of paper towel (2 layers) over cutting board. Cut the tofu in half and slice each half into 8 pieces. That makes total 16 slices, right? Are you still counting to 16? Sprinkle a little bit of salt on top of tofu. Salt helps the tofu to firm up on the surface and season them as well. Just a little bit, please. Heat your pan with mild oil such as grapeseed or canola over medim heat. Use non-stick surface pan. I use my well seasoned carbon steel pan. It creates beautiful crust on tofu. Press tofu with paper towel to absorb more moisture before you add to the hot pan. Sear the tofu for about 5 minutes. Don’t bother them. Let the oil and the heat do their job getting to know the tofu. I like my tofu to be somewhat chewy. If you want softer texture 2-3 minutes is enough. After 5 minutes you will see the golden crust is forming on the bottom. It is basically caramelizing. Make sure you pan is not extremely hot, otherwise it will burn. Adjust heat level. Medium heat was just right for my stove. 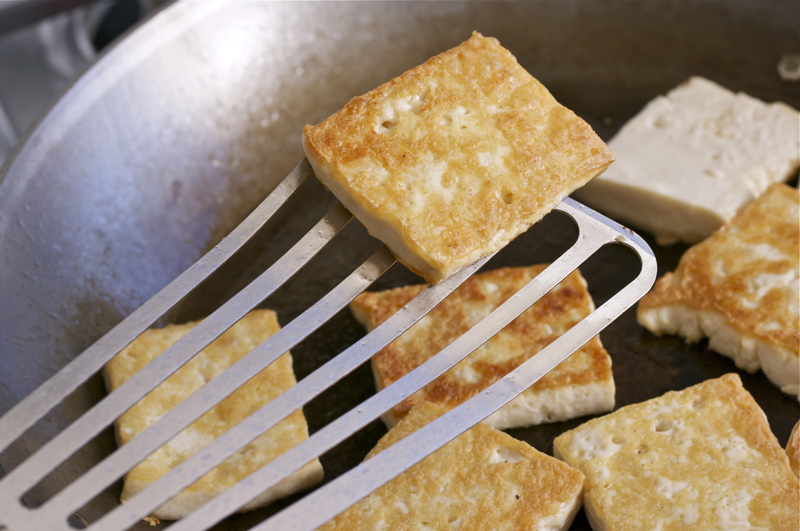 Flip the tofu slices to the other side carefully. Do you see the golden crusts? Let the other side sear for another 5 minutes or so as well. While waiting, make the sauce with given ingredients. You will see that they’ve got shrunk a little bit. They have lost some of their moisture. Place them nicely on the serving platter and drizzle with the sauce. Serve when they are warm with some rice. 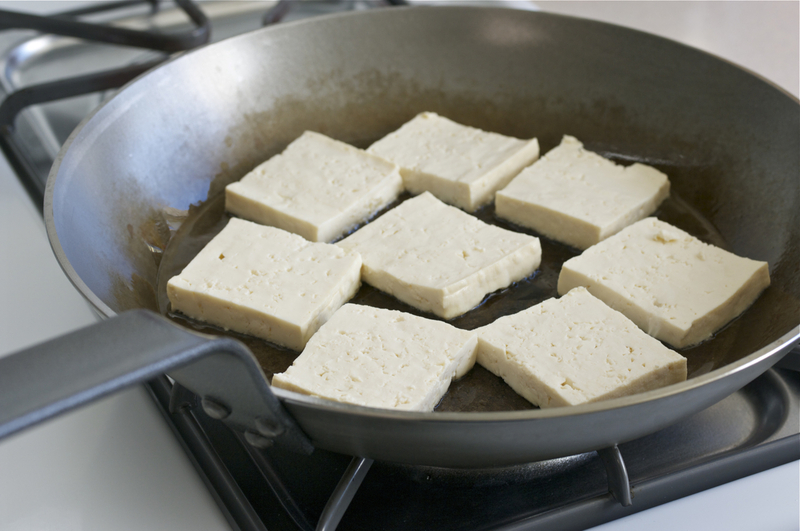 Tofu is a great way to replace meat if you want to cut down the animal protein. tons with calcium and iron. to turn one of his creation into another. It is miracle food to most Asians. 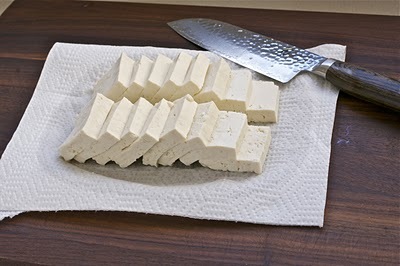 Place tofu on top of two layers of paper towels over the cutting board. Cut the tofu in half and slice each half into 8 equal slices. This will make total 16 slices, about 3/8" thick each. Spread each slices on the paper towel and sprinkle with a little bit of salt. Let it sit for 5 minutes. Heat your non-stick surface pan over medium heat, add 1 Tbsp of oil first. 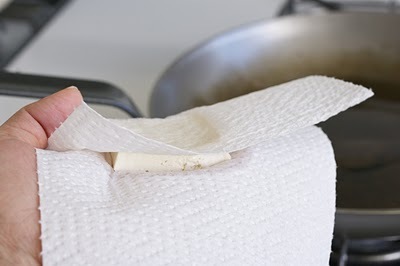 Press each tofu slices with dry paper towel to remove some moisture and add to the hot pan. Let them sear for 5 minutes until the bottom of the tofu creates golden crust. 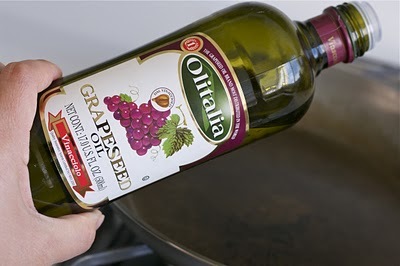 Flip to the other side, add 1 more Tbsp oil if your pan seems dry. 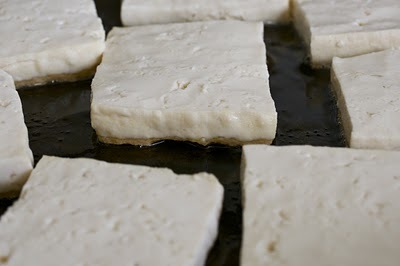 Continue to sear the tofu for another 5 minutes or so until they are done to your liking. You can adjust the time for your preference. 5 minutes on each side will create chewy texture. If you prefer softer texture 2-3 minutes should be enough. 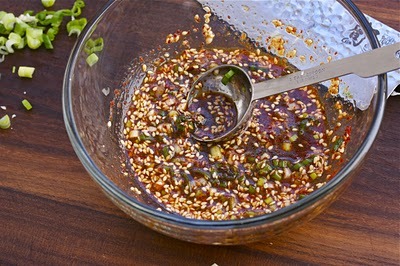 To make the sauce, mix soy sauce, chili flakes, green onion, garlic, shrimp powder (optional), sesame oil and sesame seeds in a small mixing bowl. 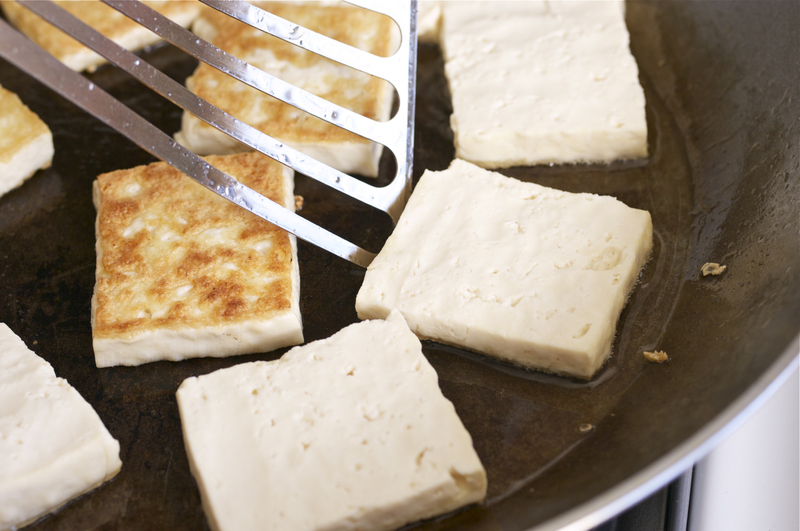 Place tofu slices on the serving platter and drizzle the sauce over. Serve warm with some rice. I love pan-fried tofu! This reminds me of a Chinese way of cooking tofu I just did hehe but I've never used shrimp powder, a good thing to keep in mind :) Lovely dish! Yes, Shrimp powder do bring wonderful flavor to the dish without noticing its existence.I often use in Asian side dishes. I think I have seen this dish on one of the Korean soap drama, when the mother was cooking it for the lazy girlfriend of the son. LOL. Love it. Bee, do you watch Korean dramas? I wish I watch them to talk about. I heard that there are couple of recent dramas about restaurant chef and a baker. I hope to watch them someday. Just out of curiosity..
Hello! I`m drooling over your tofu, they`ll make a great snack for this chilly evenings! Yes, I like Chijimi, too. Chijimi more of Korean slang words for Boochim or Jeon. I have posted one a while ago. It is called seafood pancakes. I am thinking of posting more of Korean pancakes in near future since it is good snack to eat winter time. Thanks for visiting mu blog and hope to hear from you again. Delicious!!! This is the 2nd time I made this and it was a hit w/ me and hubby! I used to teach in Korea and this was one of my favourite dishes served at the school's cafeteria...I usually serve it as a main, with some steamed veggies, rice, and kimchi, fantastic!!! thanks for all of the images, humour and step by step instructions!! Holly, 고맙습니다! 저는 2년동안 울산에서 살면서 한국 음식을 잘 먹었는데 미국에 돌아옸 때부터 지금까지 자주 안 막어요. 이제 한국 음식을 요리 할 거예요! 감사해요! Wow! Your Korean is excellent. Yes, cook lots of Korean food. 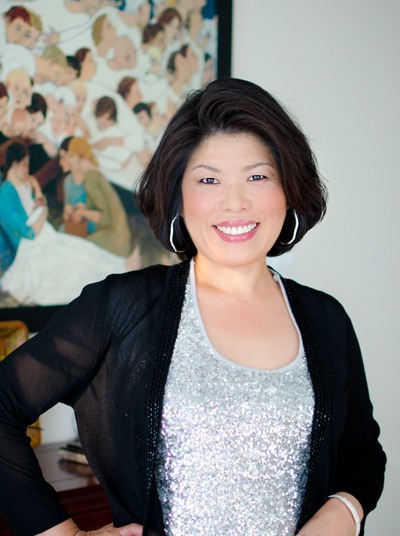 Let me know if I can assist you with any recipe. As a tofu hater from way back this recipe has opened a whole new world. I loved it! The sauce is so good. I would put it on veggies too. Thanks for sharing. Hi Yoon I don't understand how you think this is Maanchi's recipe. Because we use the same ingredients in the same dish? 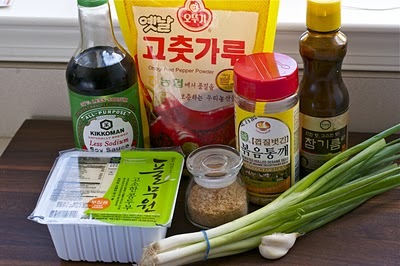 Then millions of Koreans must be using her recipe and she must have originated the dish which, I believe, is NOT. 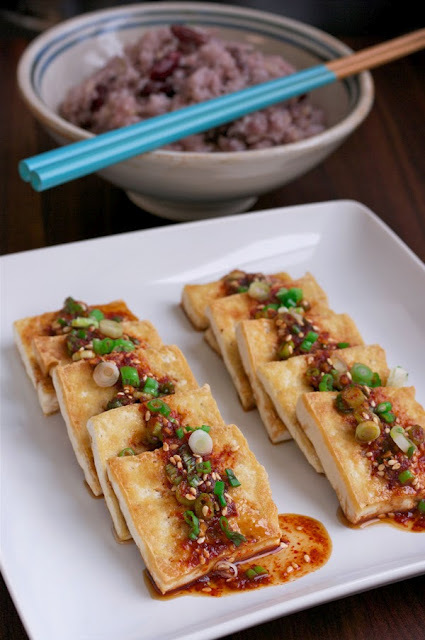 This tofu dish is one of the most common tofu dish in Korea and everyone uses pretty much the same ingredients. I want to point out, though, that I add shrimp powder in the sauce which she doesn't, and I don't use sugar which she does. The amount of each ingredients I use in the sauce is different than hers. And the cooking technique is slightly different, too. Please, read the recipe first and compare (or even research) before you comment. Loving your website! It's going to be mh go-to site for Korean food now. Thank you! Thanks Sue. 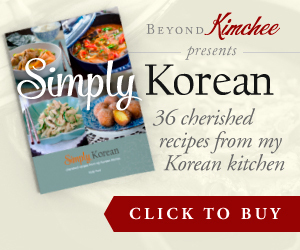 I hope my recipes will help you create wonderful Korean dishes for you and your family. Tastes like home! Beautiful and simple dish, thank you! I don't have any shrimp powder on hand but I do have fish sauce. Would that give a similar taste? You can omit the shrimp powder and it will still be delicious. Fish sauce will make the dipping sauce way too salty.